Interests: Hematopoetic stem cell transplantation, inherited diseases, quality issues in HSCT, nursing care in HSCT, cord blood transplantation, viral and fungal infection, unrelated matched and partially mismatched donors. Petr Sedlacek, is currently Professor at the 2nd Medical School, Charles University in Prague, Czech Republic. He is the head of Hematopoietic Stem Cell Transplant Unit at Department of Pediatric Hematology and Oncology. This unit performs yearly around 35 allogeneic transplants in children, mostly using unrelated donors. As the only transplant unit in Czech Republic performing allogeneic transplants in children it serves for children with whole spectrum of malignant and non-malignant disease. Dr. Sedlacek received his medical training in 1988 when he graduated at Charles University. He completed his residency at University Hospital Motol at Department of Pediatrics in 1991. He than at this institution performed a clinical fellowship in hematology. Dr. Sedlacek holds Boards of Pediatrics (1991; 2004) and Board of Hematology (1995). In 2001 he received his PhD with a thesis “Modern trends in diagnostics and therapy of relapse of acute lymphoblastic leukemia in children“. In 2011 he became a Professor of Pediatrics in the Charles´ University in Prague. Dr. Sedlacek underwent several trainings in outstanding transplant units abroad. As a visiting physician he spent one month at Hadassah University Hospital (Jerusalem, Israel; 1993), worked 6 months in Fred Hutchinson Cancer Research Center (Seattle, USA; 1996) and received support from Fulbright Foundation for three months stay in Fairview Hospital at University of Minnesota (Minneapolis, USA; 1999). For shorter stays he visited units in Berlin (1994) and Chicago (2002). 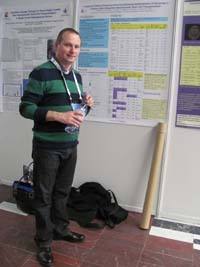 He is a member of Czech Society of Physicians, EBMT, ASBMT and I-BFM.